Unlike a hard-ticket party event, like Mickey’s Not So Scary Halloween Party, guests need regular park admission PLUS the price of the Early Morning Magic ticket (currently $69/adult, but will go to $79 beginning December 2). Me, I avoid Fantasyland on general principle, but my sister-in-law took our adorable five-year-old niece to Early Morning Magic last week and said it was totally worth it for the price. They had experienced the three attractions multiple times (like more than three times each) and eaten their fill of breakfast in less than an hour. 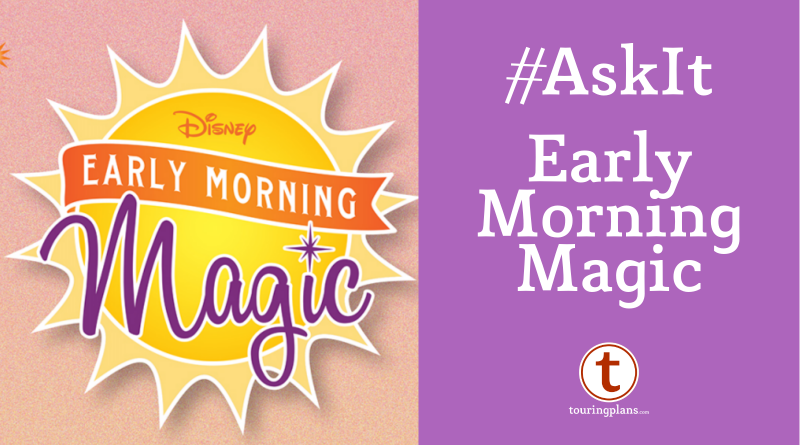 If you have a child who enjoys Fantasyland, would you pay extra for Early Morning Magic? Let us know your reasoning in the comments! Last week we asked about the new Disney Cruise Line itineraries for 2020. On both the blog and Twitter, the plurality of you were in the same boat I am (see what I did there?) and not particularly excited by any of the news. However a third of you are happy about the return of the Hawaii cruises. This is born out by the fact that right now both Hawaii cruises are sold out. Granted some of these may be speculative bookings which will clear out when payment is due, but for now it’s full. For comparison, the Vancouver to Honolulu 10-night cruise in 2015 had availability up until the cruise date. Most of the categories for cabins on either 2020 Hawaii cruise did not even make it to the general public offering. 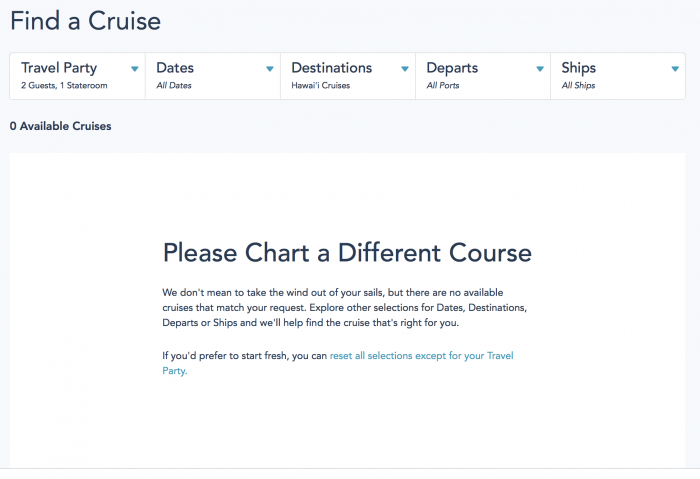 You’re not cruising Hawaii on DCL unless you’ve already booked it. Are you one of the lucky cruisers who booked a Disney cruise for early 2020? Brag about it the comments. Don’t forget to follow us on Twitter and Instagram for even more polls. See you next week! No way. Being a seasoned Liner, this really is of no use to me. We don’t do park breakfasts, and we can plan to RD to ride all of those attractions without much wait. The $10ish I spend on a subscription to this site is way more valuable than the $200+ I’d have to spend on Early Morning Magic. I think the early morning magic sounds like a better deal now, but I still would probably not do it because I don’t think that’s a good use of my money. That’s several years worth of Touring Plans subscriptions :). I don’t think its’ as much a waste of money now, but probably still wouldn’t buy it (but I did vote maybe). It would be nice if you could use dining plan credits. None of us are morning people so we would never do the early morning times. We’ve never even made it for rope drop! Prefer to sleep in and then be some of the last out of the park. I have kiddos aged 7,5,and 3 at time of our trip and this is their first trip to Disney World. I think that the standing in lines will be difficult for them so the idea of getting to ride those rides in Fantasyland without much of a weight is appealing to me….at least for our 1st Disney World Vacation. At 7, 5, and 3 there isn’t much weight either! The breakfast was pretty good though. Toyland was definitely worth it! I would pay extra for early access to the entire park, but not for just 3 rides. The Fantasyland rides other than 7DMT and PP don’t really have a wait at rope drop, and I get FP for those two. Since they are expanding the rid s and most likely the people I wonder how busy 7DMT will be now too. Pinocchio House I think was better venue than Cosmic Rays. So we just got back from WDW and did the Toy Story Early Morning Magic. It was awesome. We were two adults and two teenagers and this event had a lot of benefits for us. We arrived (via Lyft) at 7:10 and were directed to the ABC Commissary for breakfast first. It was really good – a buffet of fruit, pastry, cereal, coffee and juice, then we could get in line and order a hot entree. The cast members were awesome and said we could come back as much as we wanted until 10:00. We ate some light things then at 7:30 were allowed into Toy Story Land. We rode everything 3 times with little wait. We actually could have kept going — there were no lines at all on Toy Story Midway Mania or the Alien ride. We had maybe 10 minute wait on the coaster. They also had water and coffee set up in the land as well as several photopass photogs and Woody, Jesse and Buzz. Around 9 when the park opened to everyone we went back to the commissary and ate a more substantial sit-down breakfast then we carried on with our day. For us it was a splurge but totally worth it. It was a crowded weekend overall and super nice to feel “exclusive,” get lots of CM attention, and start the day in a relaxed way rather than sprinting to our first ride. I usually avoid the parks that have Early Morning Magic hours, unless only doing early morning and moving to another park in the afternoon. We did Early Morning Magic in 2016 when it was a relatively new thing. My teenagers and I were the first to enter Fantasyland that day, and able to ride 7 Dwarves Mine Train all by ourselves for the first run. We have video of us being the only ones on the train. They then rode 6 or 7 times in a row. After that they went on Peter Pan twice, and Pooh twice. By 9:00 we were first in line for the Princess meet, as that wasn’t included then. After that we went and had a great late breakfast that allowed us to skip lunch, which saved us about $20 per person. Getting the headline rides out of the way early allowed us to save our fastpasses for a different park in the afternoon. We felt that we were ahead of the curve in enjoying the rest of the Magic Kingdom that day. All of that made the extra cost well worth it. Nope. Disney is expensive enough already. And, between FP and rope drop, we always get on almost everything we want without much wait. Plus, the occasional waiting in line is part of the fun, really. Time together, without running around. We play Heads Up or Disney ABCs. All part of the special memories of a Disney trip. Me, my wife, and our two teenaged daughters did this in June, 2018. And although it was expensive, I would do it again. We rode 7DMT so many times and so quickly that I did not even have time to reset the timer on the Lines app to record the actual wait time. We rode Peter Pan and walked right down the moving walkway and got on it again. We rode Pooh a bunch of times. We ate breakfast and then went to BTMR for our FastPass from 10 to 11. Right after 11, we did our FastPass for Splash. Walked to Be Our Guest for lunch and then our last FastPass at Space Mountain around 1 PM. So we rode my two f my favorite rides at Magic Kingdom (Peter Pan & 7DMT) more times than I can remember, did the 3 mountains, had breakfast and lunch and were out of the park by 1 PM. That also meant for the rest of our trip, we didn’t need to try to get FastPasses for 7DMT or Peter Pan. We had our fill of those rides during this morning event. Yeah, it was a good chunk of change, but that gave me a reason to share with my two teenaged daughters my college thesis on Thoreau’s theory of time (and that is a win for everyone), and how time is the most important resource because it is the only one that cannot be recouped. So time is more important than money. Who says you never use what you learned in college? We have actually done it twice, mainly for 7 Dwarves Mine Train. The breakfast was a nice bonus too. It was definitely worth the money. The first time, we rode Mine Train 13 times! We also did Peter Pan and Pooh. The second time, we rode Mine Train 8 times. When are you ever going to be able to do that with a new popular ride. I think twice is probably enough though. I wish they would do it for Pandora. I considered doing it for Toy Story Land, but it wasn’t offered during our upcoming trip. We did it with our teenage daughter last year, and totally thought it was worth it. Loved being able to loop on rides multiple times, be first in line when the rest of the park opened, and eat a late-ish delicious breakfast that filled us up for hours.